If you want to watch Vudu abroad (outside the US) you will need a VPN. We round up the best VPNs for Vudu so you can stream from anywhere without interruption. Vudu is an online media streaming company similar to Netflix. It’s headquartered in the US and in 2015 offered over 18,000 movies and 5,000 TV shows in its library. However, unlike Netflix, Vudu isn’t available for users around the world. The service is only offered to residents in the US and Mexico. To access Vudu you’ll need an IP address from either of these two countries. The policy remains the same even if you originally signed up for Vudu from a compatible country but are trying to access it from a different location. The easiest way to unblock Vudu from outside the US or Mexico is by using a VPN. ExpressVPN Our #1 pick. Fast servers around the globe assure great quality streams. Able to unblock Vudu and most other streaming sites from almost anywhere. Best in class privacy and security features. Includes 30-day money back guarantee. NordVPN Hige server network that is able to unblock almost any streaming service, including Vudu. A budget provider that doesn’t compromise on security and privacy features. CyberGhost Low-cost service with some of the fastest streaming speeds we have tested. Easy to use apps are great for beginners. IPVanish Prefered by Kodi and Fire TV Stick users. Speeds are great for watching Vudu, but can struggle with unblocking Netflix or Hulu. VyprVPN Unblocks Vudu and plenty of other streaming content at good streaming speeds, but a bit pricey. Short for Virtual Private Network, a VPN encrypts all the traffic flowing to and from your device and tunnels it via a server of your choice. Hence it makes it seem that you’re accessing the web from a location outside your current city. A VPN also renders it impossible for ISPs, hackers, and surveillance agencies to monitor your internet behavior. It’ll unlock a host of geo-restricted content. Signing up for and using a VPN is legal and by doing so you’ll be joining a community of millions of people around the world who access this option. Your behavior won’t be under scrutiny as long as you don’t use a VPN to commit an illegal act. If you’re an expat American or Mexican trying to access Vudu, your best bet is to sign up for a VPN. How do I use a VPN to unblock Vudu? ExpressVPN is an excellent choice because of its customer-first approach, rapid speed, and a large network of servers. The company operates over 3,000 servers spread across 94 countries with quick and efficient connections to all and sundry. There are 18 server locations in the US and one in Mexico. Express is a popular choice, and with all those options it’ll be easy to access Vudu. ExpressVPN does not store any traffic logs. It does, however, extract some minimal information such as the date (not time) of connection, choice of server location, and total bandwidth used. The company is headquartered in the British Virgin Islands – which means it’s not subject to any mandatory data retention laws. A reassuring factor is that the service will never log your individual IP address. It’s also possible to sign up via a burner email account and pay through Bitcoin – adding additional layers of privacy and anonymity. ExpressVPN utilizes 256-bit AES-CBC as its encryption standard as well as both HMAC authentication and perfect forward secrecy. There’s an internet kill switch included, referred to as a network lock, which means all web traffic will be stopped if the connection drops unexpectedly. Other than Vudu, Express is also able to unlock content on Netflix with ease. It’s similarly compatible with both Hulu and BBC iPlayer. There are apps for both Android and iOS which mean it’s possible to download the companion Vudu app and stream video directly on your phone. Desktop support for Windows and MacOS is also included. BEST VPN TO WATCH VUDU ABROAD:ExpressVPN is our #1 Choice. A blazing fast and reliable choice. Sets the standard for unblocking the most geo-restricted streaming services. Top privacy features and keeps no logs. Try it risk-free with the 30-day money back guarantee. NordVPN has been around for over ten years and it remains a popular choice for consumers because of its solid service and quick speed. It’s another VPN provider that has a true zero-logs policy – there’s logging of information related to user sessions, traffic, or timestamps. NordVPN has received requests for information in the past but the policy meant that it wasn’t able to hand anything over. Servers were also confiscated in one instance but there wasn’t anything on them that would be able to identify users. The company operates 5,133 servers in 60 countries – 1,778 of these are located in the United States and Mexico. Furthermore, they’re bifurcated according to strength – some are suitable for stricter encryption such as anti-DDoS and double VPN, while others are better equipped for video streaming and dedicated IP. Hence it’s a solid choice not only for unblocking Vudu but also things like stability of the connection. Nord is able to overcome the Netflix VPN ban, as well as unlocking content from both Hulu and BBC iPlayer. Encryption standards are solid. The 256-bit AES protocol encryption protocol is used by default coupled with 2,048-bit SSL keys. DNS leak protection is enabled. BEST BUDGET VPN:NordVPN offers great value. A great value option which works reliably with Vudu. Connects up to 6 devices simultaneously. App doesn’t offer server switching choice. 30-day money back guarantee. CyberGhost maintains that it doesn’t log user behavior and browsing habits, so that should ease concerns about privacy and anonymity. It was, however, recently acquired by an Israeli firm registered in the UK so we’ll have to wait and see if the policy changes. There are over 3,700 servers spread across the world, 730 of which are in the United States, so accessing Vudu content shouldn’t be an issue. The also operate 20 servers in Mexico. The VPN service won’t unlock geo-restricted content on Netflix but does work on BBC iPlayer. Encryption standards are solid – CyberGhost Pro uses 256-bit AES encryption on the OpenVPN protocol by default along with 2,048-bit RSA keys and MD5 HMAC authentication. There’s also an internet kill switch included, which means web traffic will be halted if the connection drops unexpectedly. Read our review of CyberGhost. IPVanish is headquartered in the US but your personal data is not at risk because it simply stores zero user information. The only time some data is retained is when an account is registered for the first time. After that, you don’t have to worry. It’s also a pretty robust choice if you’re looking to stream video and other media content. Servers are optimized for speed, stability, and security – and there’s over 1,300 of them spread across 60 countries, including over 650 in the US and Mexico. There’s a multitude of options to unlock Vudu. Encryption standards are solid, too. It uses 256-bit encryption on the OpenVPN protocol by default, SHA512 authentication, and a DHE-RSA 2,048-bit key exchange with perfect forward secrecy. This means that even if your account is compromised, it’ll be impossible for hackers to decrypt past session data and figure out what you’ve been up to on the web. The additional security of an internet kill switch is handy to have when accessing geo-restricted content.IPVanish delivers on this front too with the option available when you sign up. IPVanish doesn’t unlock geo-restricted content on Netflix or Hulu but does so easily for BBC iPlayer. There are apps for both iOS and Android as well as desktop support for Windows and MacOS. IPVanish is a good VPN choice for Fire Stick users too as it is easy to install. FAST AND SECURE:IPVanish gives you solid security in a speedy package. Lacks 24/7 support. It offers a 7-day money-back guarantee. This policy could make some users nervous but the company says all data is only retained for 30 days and is used for troubleshooting. It adds that there’s no way of determining exact details of web traffic or content of communications. VyprVPN is a popular choice in China because it’s able to break through the Great Firewall. That’s no small achievement because it’s literally pitted against thousands of government-appointed engineers working around the clock to block sites. Many consider it to be in the top-tier of VPN services. The company owns and manages entire data centers – as opposed to renting from third-party providers. This means it’s in total control of the traffic flowing through its servers, optimizing speed and stability of the connection. All connections are encrypted by the OpenVPN protocol, 256-bit AES encryption, 2,048-bit RSA keys without perfect forward secrecy, and SHA256 authentication. A premium version of the package allows access to the Chameleon ™ protocol, which scrambles OpenVPN metadata so deep packet inspection cannot recognize it. There are over 700 servers spread across the globe. The company says there are eight server locations in the US and one in Mexico but doesn’t give a figure of how many servers there are in total within these two countries. EASY TO USE:VyprVPN is user friendly. A solid choice for unblocking Vudu. Stores no logs, offers great security and unblocks most streaming services. More pricey than some. 30-day money-back guarantee. Click here to read our full review of VyprVPN. Should I use a free VPN to unlock Vudu? Free VPNs are lurking around on the web and people could be tempted to try them out. But streaming video certainly isn’t one of their strong points. There’s usually just one or two servers you can connect to – and it’s also possible that they’ll make you wait in line if there’s network congestion. Speeds are slow as bandwidth throttling is common. Encryption parameters are weak, so don’t assume your connection will be optimized for privacy and security. And there will most likely be a data cap which means your connection can terminate if you stream Vudu for too long. Our recommendation is to avoid. If a service is free then it’s likely that you’ll be the product instead. And free VPNs are known to monetize by aggressively inserting tracking cookies, monitoring your browsing patterns, and selling the data to third-party advertisers. You run a real risk of a malware infection – which can lead to permanent data loss. 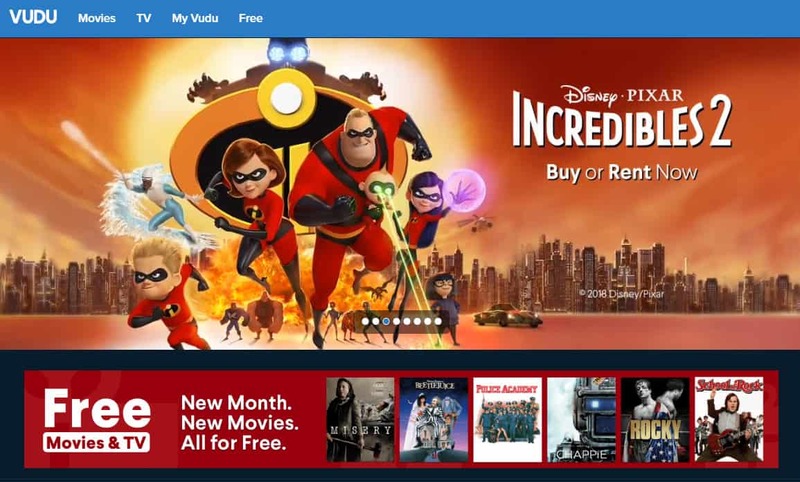 If your intention is to stream Vudu on a desktop PC, Macbook, or smartphone then it’s a simple procedure of logging in to your VPN app first, connecting to a compatible server, and using Vudu like you normally would. We recommend that you clear all cached data to remove location identifiers. These devices don’t come with in-built support for VPN apps – hence there’s no native software that’ll do the trick. To set up the app we recommend leveraging the VPN on a virtual router. This is possible because most PCs that can connect to wifi are also capable of broadcasting their own wifi signals – similar to how smartphones set up mobile wifi hotspots.